I think that only a writer as talented as Hosseini could give me goosebumps after reading a 48 page illustrated letter. 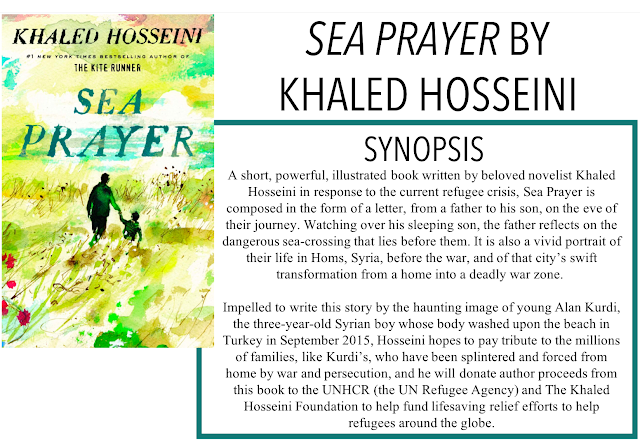 I am back with another review, today it is Sea Prayer by Khaled Hosseini. Thanks so much to Penguin Random House for sending me a copy of this book for an honest review, as always, all opinions are my own. This will be a fairly quick review because this is a fairly quick book. I don't really know what age I would really categorize this book, it's not quite a children's book but I also wouldn't say it was an adult fiction. This is a quick read, I think it took me about 5 minutes, maybe longer depending on how in depth you go with the illustrations. But I still think that Hosseini is able to capture the emotions of the situation for the reader to experience. The illustrations are absolutely stunning, beautiful watercolours that really capture the spirit of Hosseini's prose. The letter itself is immensely compelling, embracing the fear of a father with the hope for safety. While I wanted more length to this, I understood Hosseini's rationale behind keeping it short and powerful. Overall, definitely worth the read - especially if you are already a Hosseini fan like myself - and as a tribute to the refugees trying to find a home.